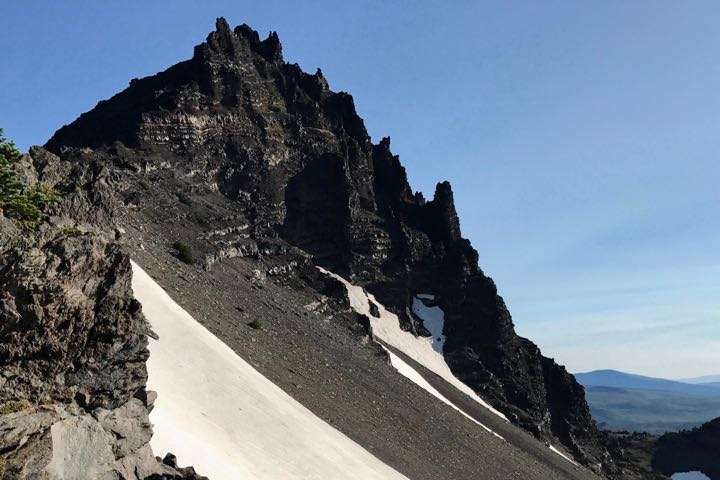 The South Ridge of Three Fingered Jack is a great option for those climbers looking for very exciting alpine rock climbing. After a five mile approach on the beautiful Pacific Crest Trail, the climb begins in earnest. We’ll leave the main trail, and head up a steep climber’s path that gains the South Ridge of the peak. At the ridge, we often take a break, get geared up and get ready for the technical section of the climb. Three Fingered Jack starts out with some easy scrambling to warm up, and the ridge progressively get narrower and narrower until the first big obstacle is encountered – the crawl. We belay this section, and then continue on the ridge to an additional two pitches of steep climbing. The summit of Three Fingered Jack is the size of a coffee table making it the smallest of Oregon’s volcanic summits.